A group of world famous photographers teamed up Ghanaian children who were saved from trafficking in an art collection set to be auctioned at National Arts Club in New York City. 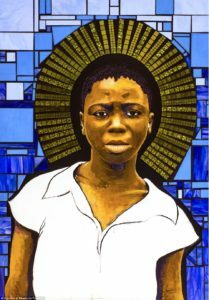 New York based anti-trafficking organization Beauty for Freedom is hosting an upcoming exhibit that will raise awareness of victims of labor trafficking in Ghana. Funds raised during the exhibit will go towards the rescue, aid and recovery of other children in the area. 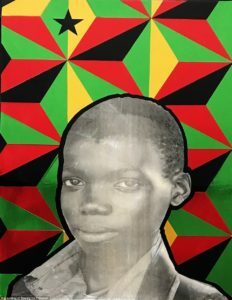 The 13-piece multi-media exhibit features work from 12 artists who collaborated with at-risk youth at Challenging Heights, a Ghanaian anti-trafficking organization. 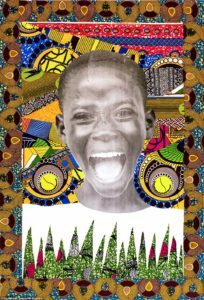 An exhibit at The National Arts Club in New York will feature 13-pieces created in collaboration by world famous photographers and Ghanaian children. The artworks pictured was created by Ydania Lopez, Erica Simone, Jerry Chu. Beauty For Freedom teamed up with Challenging Heights to teach art therapy to survivors and at-risk youth through mediums such as watercolor painting, photography and mural workshops. ‘Deploying arts and art therapy is a big part of our work at Challenging Heights,’ James Kofi Annan, president of Challenging Heights and survivor of child slavery, said. ‘Remember there is an issue of self-esteem with survivors, so this work with Beauty for Freedom helps these children to have improved self-esteem…to hope and to dream that anything is possible and that they can do it. ‘Challenging Heights is an organization that I created to solve the issues I faced in my childhood. ‘A childhood where I was sold into slavery at the age of 6 years old and finally escaping at the age of 13, working up to 17 hours per day facing unspeakable abuses and hard labor. The goal of the exhibit is to empower the young survivors of trafficking as artists and creatives while raising funds for the rescue, recovery, education and reintegration of more survivors in Ghana. The 12 artists included in the exhibition are Nick Walker, Erica Simone, Ydania Lopez, Mark Wagner, Laura Anne Brooks, Jose Castillo, Alfredo Martinez, Michael Raeuschl, Zephy, Travis McCann, Jerry Chu and Sophie Bartsich. One hundred percent of the proceeds raised during the auction will go towards the programs at Challenging Heights and Beauty For Freedom. The 13-piece exhibition can be viewed at The National Arts Club in New York on April 9 from 6.30pm to 9pm. For more information about the exhibition, visit: beautyforfreedom.org.